Yvonne Mason, a retired teacher who spent 17-years teaching English in South Carolina public schools, received a letter from the White House full of grammatical errors. She says the letter was “stylistically appalling!!! “I have never, ever, received a letter with this many silly mistakes,” she said. The White House had responded to her on May 3 after she sent the Trump administration a note about the Parkland shooting massacre. She posted a photo of the letter to Facebook — complete with her edits made in purple ink — which went viral. “Got a letter from Mr. Trump. 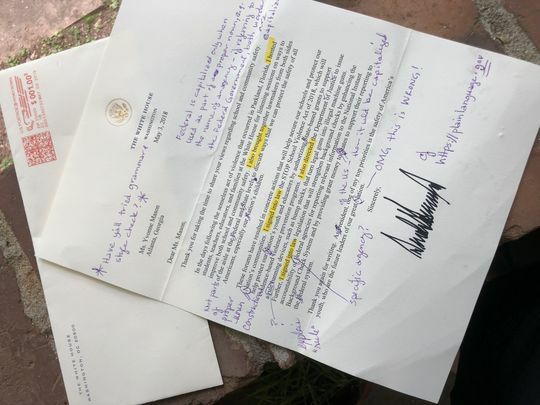 Will be returning it tomorrow,” the caption read.She said although the letter was likely written by a White House staffer and not by the President himself, the mistakes were unacceptable. “When you get letters from the highest level of government, you expect them to be at least mechanically correct,” the educator added. And if it was up to her to grade the White House? She would give them a failing score. “If it had been written in middle school, I’d give it a C or C-plus,” Mason said.